This textbook introduces the molecular and quantum chemistry needed to understand the physical properties of molecules and their chemical bonds. 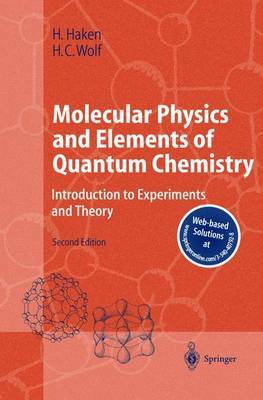 It follows the authors' earlier textbook "The Physics of Atoms and Quanta" and presents both experimental and theoretical fundamentals for students in physics and physical and theoretical chemistry. The new edition treats new developments in areas such as high-resolution two-photon spectroscopy, ultrashort pulse spectroscopy, photoelectron spectroscopy, optical investigation of single molecules in condensed phase, electroluminescence, and light-emitting diodes. "The presentation is self-contained and logical, often with excellent illustrations chosen with care ... The perspective is fresh and well suited to the current interest in materials science ... I recommend the book and have used it as independent reading for our majors in physical chemistry."